Thursday is here, and we are all getting excited because tomorrow is Friday, which is the start of the weekend for some of us! Some people are lucky enough to work close to where they live, which mean they can easily walk to work. However, what people may not realize is that sometimes there are hidden gems under the streets they walk on, and they may not even know it! Today’s optical illusion is all about what lies beneath, which may include a beautiful, hidden waterfall. 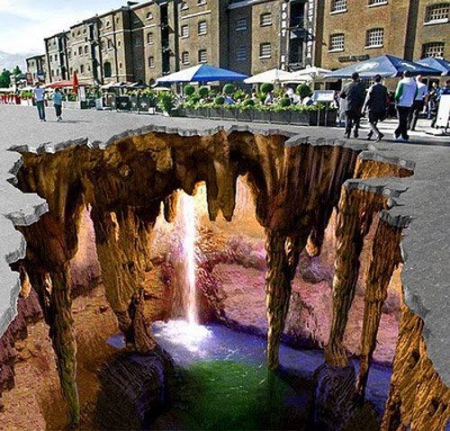 What do you all think of this waterfall that is just under the street? There is a secret to this hidden waterfall, and that is the fact that it is not real, but rather a very detailed and amazing work of art! Ready for another optical illusion that is incredibly deceiving? Take a look at this broken window, and you may all notice that it really is not broken, but just a very clever way for to get attention of the people passing the window on the street. After all, the human eye is going to go directly to the center, which was where this shop cleverly put the item they want people to see! Hope you all have a great Thursday!